According to National Aeronautics & Space Administration (NASA), nothing is more important to us on Earth than the sun. Without the sun’s heat and warmth, the Earth would be a lifeless ball of ice-coated rock. The sun warms our seas and oceans; it stirs our atmosphere; it generates our weather patterns; it gives energy to the growing plants that provide the food and the oxygen for life on Earth. No wonder in many countries and cultures from primitive time and until now, many worship the sun. Many of us come from where the sun is prevalent and therefore we do not appreciate the significance of the sun. But for those who dwell above the Tropics of Cancer and below the Tropics of Capricorn, they will appreciate the sun the more; especially those in the Arctic and Antarctica, where they hardly see the sun in any given year. They always rejoice when the sun shows up. I will wish we have more sunlight in the UK yearly. That will make my living here more comfortable. Such is the power of the sun. I had had the mind that when we become citizens in the UK, we will migrate to somewhere warm (Florida). As much as I love the UK, I don’t like the climate. But God has a way of ordering the steps of His children. God made sure that we sow in this land. Thank God, for He has also prospered the seed. As powerful as the natural sun might be, there is another Sun that is more powerful. He is called the Sun of righteousness. May He rise upon you afresh today in Jesus name. Whenever I see a baby of deer and lamb jumped around when they are in the open field. I used to wonder why. Now I know that it is because the Sun of righteousness has arisen upon them. May the Sun of righteousness arise on you with healing in its wing. May you go forth and skipped like the calves from the stall. – Someone here, you have thought this is your benchmark, but the Sun of righteousness will fire you up again. You will not only walk forward, you will jump forward in Jesus name. – Someone here, the Spirit of God asked me to tell you that this is your morning. I’m not sure how old you are now, but your morning has just begun. The natural sun can hurt those who mess about with it. It can’t be domesticated like other celestial bodies. So also is the supernatural Sun. But for God’s children, the radiation from heaven upon us is just right. May God shield you from harm. May God bestows His glory upon you. May the glory of God radiates all over you. May no good thing be withheld from you. Luke 1:78-79 – Through the tender mercy of our God; whereby the dayspring (rising sun) from on high hath visited us, To give light to them that sit in darkness and in the shadow of death, to guide our feet into the way of peace. By the mercies of God, may the Sunrise from on high visit you. May all forms of darkness around you disappear. Any shadow of death haunting anymore to fissile away in Jesus name. May Jehovah guide your feet in the way of peace. After sojourning in Syria for over 20 years, God told Jacob to return to Canaan (Gen. 35:1). He was however still frightened of his brother – Esau. On his way home, he sent messengers to his brother, and to his shock and terror, he was told that Esau was coming to meet him with 400 men! Jacob had to share his servants and belongings into groups and also is family and divided them to worship Esau, while he was coming at the very rear. Overnight, he had an encounter with God who changed his name; and as he was walking out of Penuel, his destiny was changed from a supplanter to triumph with God (Gen.32:22-31. It happened that when Esau that was coming with 400 men to fight his brother saw him, instead, he came down from his ride, ran to meet him; embrace him; fell on his neck; kissed him; and wept over him. – You are here, you are terrified of a certain host that has come against you. Instead of the hosts attacking you, their disposition to you will change. They shall run to welcome you; embrace you; fall on your neck; kiss you and weep for their intent. May your enemies beg to make peace with you. While in slavery, it was like the sun of his life had set. How could he ever get his freedom again? Who will pay the price over his head? Will he ever step unto Canaan soil again? Will he ever enjoy the love of his father again? Will he meet his mother alive again? These were disturbing questions he would be asking himself. 13 years later though, the Sun of righteousness shone on him anew. He was released from dungeon and straightaway became the second most powerful man in Egypt. – There is someone here, God is taking you to a higher level of splendour and opulence. May you get there. – To someone, God says your years of captivity and servitude are over. God will take you to such a high pedestal you will never have imagined. – God is wiping off the shame of your youth now. The reproach of your early years shall be forgotten. God asked Moses to assemble the children of Israel at the foot of Mt. Sinai, where He would give them instructions, and he should come up the mountain to meet Him. Moses was there for 40 days and 40 nights, after which God gave him 2 stones containing the Ten Commandment. But when Moses got to camp, he met the children of Israel worshipping an idol and he became really angry. He broke the 2 tablets he just received from God. 40 days gone with the wind. God later asked Moses to hew 2 stones like before and bring it to the mount again. Moses was again there for another 40 days and 40 nights. This time, when he returned, his face was shining to the extent that no one could look directly at his face, for the Sun of righteousness has risen upon him. – There is someone here, having confessed and forsaken your sins before God, the devil is still tormenting you with the guilt. I am asked to tell you that your iniquity had been pardon. Your error is forgiven. Your mistake has been taken away. Go and sin no more. God, however, wants you to draw closer to him. So that your face can start shining in an amazing way. In Judges 11:1-11, the Bible tells us about a man who was born into an honourable family, his father was an important figure in Israel and his clan reputable. It was like the sun had risen on him early in life. Unfortunately, when his father died, the other children of his father sent him packing. He began to live in caves and strongholds. Not too long, the Sun of righteousness rose upon his life again. He became the leader of the whole of Israel. – You are here, you have been pushed aside, I am asked to tell you that those who pushed you aside will soon see you in their front. – Those who thought you are not qualified to lead their tiny group will soon find out that you are to lead a far larger group which they would still be among. – There is someone listening to me, I am asked to tell you that you are coming out of caves. Strongholds are no longer your abode. You are marching to the palace. – You are here, for the greater part of your life, you have experience hatred. You will start experiencing love from now. The condition for enjoying the Sun of righteousness. As the name of the Sun implies, one has to be righteous to enjoy the Sun’s benefits. Then how can one become righteous? Genesis 15:4-6 – And, behold, the word of the Lord came unto him, saying, This shall not be thine heir; but he that shall come forth out of thine own bowels shall be thine heir. And he brought him forth abroad, and said, Look now toward heaven, and tell the stars, if thou be able to number them: and he said unto him, So shall thy seed be. And he believed in the Lord; and he counted it to him for righteousness. Galatians 3:6-7 – Even as Abraham believed God, and it was accounted to him for righteousness. Know ye therefore that they which are of faith, the same are the children of Abraham. Father, let my enjoyment of You increase greatly. Father, move me to a higher level of glory in You. Father, let Your countenance upon me increase. Father, let my life reveal Your glory to the whole world. Father, don’t let me be a local champion, turn me into a global showpiece of Yours. 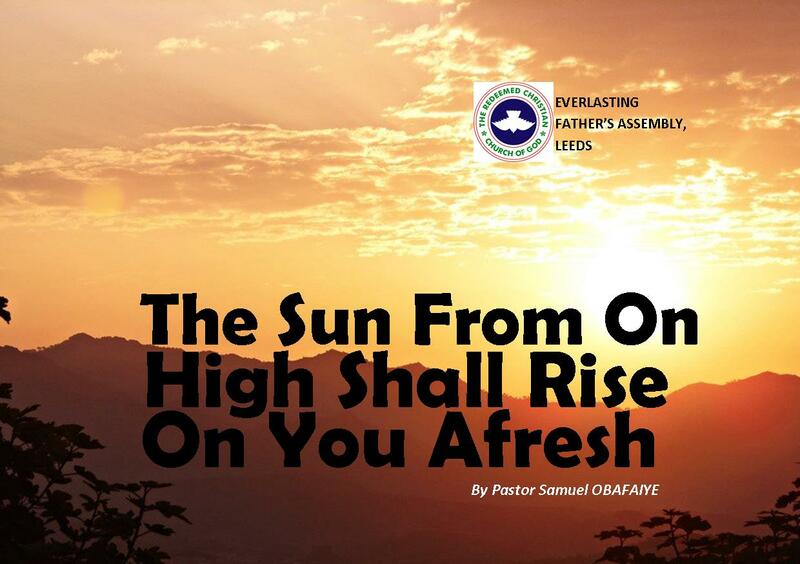 The sermon, The Sun From On High Shall Rise On You Afresh, by Pastor Samuel Obafaiye, was delivered on September 2, 2018.